Citation: C N Trueman "Hugh Dowding"
Hugh Dowding is considered one of the masterminds behind the victory in the Battle of Britain – one of the most prominent battles in World War Two. Dowding is seen as one of the more important military commanders of the war. Dowding was born in Scotland in April 1882 and educated at Winchester College and the Royal Military Academy at Woolwich. Dowding served in Ceylon, Gibraltar, Honk Kong and then for six years in India. When he returned to Britain from this tour of duty, Dowding took up flying and received his flying license in 1913. Following this, he joined the newly created Royal Flying Corps and fought in World War One where he commanded 16 Squadron. During this war, he clashed with the head of the Royal Flying Corps – General Hugh Trenchard – over the issue of rest for pilots exhausted by constant flying sorties. As a result, Dowding was sent back to Britain. He was promoted to brigadier-general, but took no more active part in the war itself. After the war, Dowding joined the newly established Royal Air Force becoming a vice-marshal in 1929. In 1933, he was promoted to air marshal and in 1934, Dowding was knighted. It was in the 1930’s that Dowding made his real mark. He was a believer in research and development and pushed hard for this aspect of the RAF to be adequately funded. He knew that the days of the bi-plane were numbered and pushed for a fast fighter. The led to a competition that ended with the construction of the legendary Supermarine Spitfire. By 1937/38, Dowding became convinced that a war with Nazi Germany was a real possibility and the Nazis had done little to disguise the growth of the Luftwaffe. In April 1937, the Luftwaffe had demonstrated its ability to destroy an undefended city with the bombing of Guernica in Spain. For this very reason, Dowding believed that Britain had to be in a position to defend itself from German bombers – hence his part in pushing for the development and manufacture of both the Spitfire and Hurricane. Dowding also pushed for the development of the radar – to give the British an adequate warning of an enemy attack. In 1938, Dowding believed that Britain was not able to adequately protect itself against the Luftwaffe. For this reason, he advised Neville Chamberlain to pursue a policy of appeasement at Munich. Whereas Chamberlain has been criticised for ‘giving in’ to Hitler and not making a firm enough stand against him, Dowding believed that he needed more time to develop Fighter Command to enable Britain to defend itself. In 1940, Dowding played his part in providing what fighter cover he could give to the men being evacuated atDunkirk. However, both he and Winston Churchill believed that any full use of what resources Dowding had would be reckless, especially for what many considered to be a lost cause. In this, Dowding proved to be correct. Dowding’s resources as head of Fighter Command were about to be given a massive test – one which they could not fail. In the Battle of Britain, the men of Fighter Command were pushed to the limit. As in World War One, Dowding clashed with other senior officers in the RAF over tactics. Men like Air Vice Marshal Douglas and Air Vice Marshal Leigh-Mallory wanted the pilots of Fighter Command to engage the Luftwaffe before they crossed the English coastline. 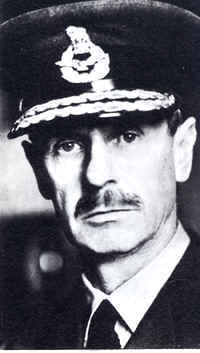 Dowding rejected this approach as he believed that any British/Allied pilot that parachuted out over the English Channel was more liable to be drowned. Any combat over the mainland that led to a pilot parachuting out, meant that the pilot had a greater chance of survival. Dowding knew that Fighter Command was not short of fighter planes. But it was short of experienced pilots and he resolved that Fighter Command could not lose any more. Hence why he engaged the Luftwaffe on ‘home’ soil. The victory in the Battle of Britain ended any hope of Hitler launching “Operation Sealion“. In recent years, some historians have re-assessed the importance of the battle, claiming that Hitler’s heart was not in an invasion of Britain and that he was fully focused on the an attack on Russia. However, no-one in Britain would have known this in August/September 1940 and no chance could be taken that the barges on the French and Belgium northern coastline were there only as a threat. Dowding has been given the credit for the victory in September 1940 – along with the “few”. For this he was awarded the Knight Grand Cross. However, his career did not end in the glory many feel it should have done. Air Chief Marshal Portal, the chief of air staff, did not agree that Dowding had used the right tactics and in November 1941, the man who had masterminded the victory that was the Battle of Britain, was forced to retire from the position as head of Fighter Command. Age was not an issue as Dowding was only 59. Dowding was replaced as head of Fighter Command by one of his chief critics – Air Vice Marshal Douglas. Dowding was given ‘special duties’ to do in America involving aircraft production. However, he retired from the Royal Air Force in July 1942 and was awarded a baronetcy in 1943. Dowding died on February 15th, 1970.